Instead of trying to find your perfect match in a dating app, we bring you the �Author-Reader Match" where we introduce you to authors as a reader you may fall in love with. It's our great pleasure to present�J.A. Hennrikus! 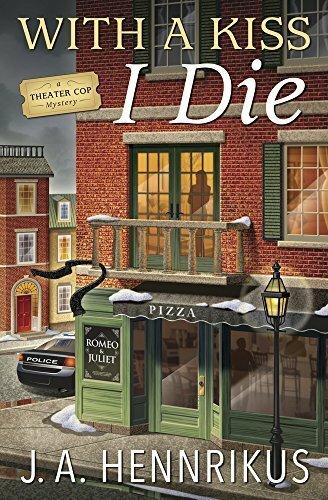 Writes: Cozy and traditional mysteries, with my latest release, With A Kiss I Die, #2 in my Theater Cop series hitting the shelves on April 8, 2019. About: Mystery writer seeks readers who like a good mystery that is combined with a touch of romance against the backdrop of a theater company. 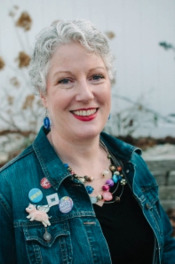 When retired cop Edwina "Sully" Sullivan learns that a production of Romeo and Juliet―which Cliffside Theater's Dimitri Traietti left town to direct―is in serious trouble, she sets aside her grant applications and heads to Boston to help. Between managing Dimitri, consulting with costume and set designers, and schmoozing with potential funders, Sully puts on nearly every hat in the biz. But the one hat she doesn't expect to wear is that of her old job as a cop. When a socialite is murdered in Boston Garden, Sully's ex-husband becomes the prime suspect. So she dusts off her investigative skills and once again steps into the spotlight of crime solving. riggers a release with the natural painkillers, endorphins, inside you.Laughter furthermore reduces worry hormones, allows reduce pain, allows muscle mass to relax and is also very helpful for the inhalation process mainly because frequent bouts of wit empties air with the lungs. - Take some time out so that you can relax plus put a person's worries away.It may perhaps be getting together with friends, watching a movie and also playinriggers a release with the natural painkillers, endorphins, inside you.Laughter furthermore reduces worry hormones, allows reduce pain, allows muscle mass to relax and is also very helpful for the inhalation process mainly because frequent bouts of wit empties air with the lungs. - Take some time out so that you can relax plus put a person's worries away.It may perhaps be getting together with friends, watching a movie and also playing a sport of practicing tennis.You can also distract you with artsy pursuits just like painting, pottery as well as writing poetry.Finding solutions to de-stress will help decrease a person's flare-ups greatly, not to bring up also improving your wellbeing. - Learn relaxation techniques including meditation or even breathing physical exercises.This allows you feel relax and peaceful rather than over reply unnecessarily that will external gatherings.Practice all these techniques inside mornings or during the night every evening. It is crucial that you discover ways to make serenity with strain and always keep things during perspective, as you are cannot completely escape worry.Prevent eczema simply by getting a reduced amount of tense.If you feel less tense, you are less likely to experience a body response including the uncontrollable suggest that to mark yourself.